The wine world can be contradictory at times. Although we are supposed to promote a product that reduces stress, shares accessible human stories from various areas around the world and, ideally, brings people together, it has sometimes been promoted as a drink that sets up boundaries between economic classes, sophistication levels and educational backgrounds. Unfortunately, I have witnessed the elitism and false presentation of knowledge, both from past colleagues and wine connoisseurs, and I am sad to say that one time, I was told from a long time employee of a well-respected wine retailer in Manhattan that it was better to “seem like you know what you are talking about” instead of actually passing along solid facts. The “old school” way of talking about wines was to look seriously imposing, while pronouncing a bunch of foreign words (that were indiscernible to many wine consumers), and proclaiming that the wine experts’ personal taste, especially in regards to high quality wines, was the one of choice. If someone in the wine world was smiley, warmly generous, and he/she was transparent about what they knew and didn’t know about wine, then his/her opinion was not taken as seriously in the fine wine world. Throughout my career in the wine industry, I have met all kinds of people and have been given all sorts of advice. I have spent many, many years trying to learn as much as I can while always being open to the idea that it is impossible to know everything; most importantly, I wanted to serve my customer – whether it was the wine buyer for restaurants and retail stores (when I worked in distribution) or wine consumers (when I worked for a retail store). The idea of trying to figure out what was best for the people whom I was serving while conveying accessible, inspiring wine stories that were relevant to their desires and needs was always the priority. 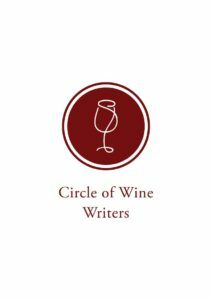 But it would be sometimes pointed out by others in the wine trade, or wine communication world, that trying to be in service of the customer with such a generosity of spirit would just devalue my presence as a knowledgeable and experienced wine voice. Warm, fuzzy feelings did not equal high quality wine expertise. 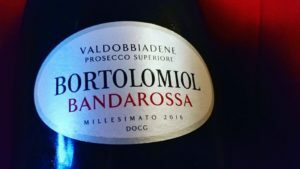 I spent many of my Tuesday nights in October participating in a Twitter virtual tasting (using hashtag #winestudio and #ConValDOCG) talking about Prosecco Conegliano Valdobbiadene Superiore DOCG. I know, I was just starting to talk about generosity in terms of being accessible to others and here I go throwing some seemingly intimidating words around… but these words are important to a specific place and culture, and they are actually very easy to understand. 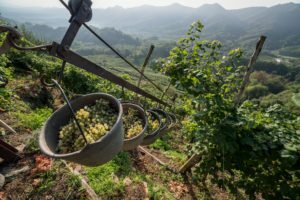 Many of us know Prosecco as a fun and delicious sparkling wine… the name Prosecco is based on a winemaking zone in North-East Italy, in the region of Veneto. 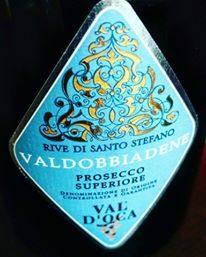 Conegliano Valdobbiadene is an area in Prosecco that has a reputation for being one of the top places for outstanding wines… the Superiore DOCG (DOCG indicating the highest quality designation) which is noted on the bottle lets a Prosecco lover know that this wine has been subjected to the strict standards. I think it is fair to say that many of us think of Prosecco as a quaffing wine… and I do not mean that in a derogatory way. No matter how much artisanally made, complex, fine wine I drink and love, I will always want my “drinking on the porch” wine. 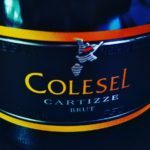 And few other wines have been as successful in that regard as Prosecco, since its generosity of flavors and textures invite all wine drinkers to enjoy these wines. Prosecco became so popular that wines made in different areas across the globe started to use that term on their label calling it a ‘Prosecco style’ wine with the “Prosecco” grape… the producers who actually lived in the designated Prosecco area knew that they needed to protect their name, a place that points to a particular area, and part of that campaign was to bring back the proper name of the grape, Glera, and to educate people that Prosecco wines that had DOC or DOCG superseding the name on wine labels were the only true Prosecco sparkling delights on the market. But just like I was told that being too friendly, down to earth, warm and generous would diminish my professional presence in the wine world, the same has happened to Prosecco. Because they have become so successful with a generously tasty style that has a welcoming presence on the wine shelves, it has made many people underestimate their quality potential for more serious wines… there are even some who like to snicker at its evident accessibility because the old idea that top wines need to be austere or only appeal to a small section of the population unfortunately still prevails with some fine wine connoisseurs. I remember a woman coming into a fine wine retail store that I worked in, asking for the most expensive Prosecco we had…. at the time, we only carried some of the moderately priced Prosecco wines, and I told her that expensive, fine wine Prosecco didn’t exist. She was frustrated as I tried to point her towards the Champagne section, because she loved Prosecco and she said that there had to be a higher quality version… I felt that day that I failed that woman because of my own ignorance. 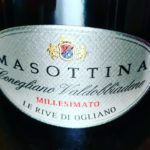 She made a great point – just because Prosecco is a delicious sparkling wine that many people love doesn’t mean it can’t be made into great wine. During our Twitter #winestudio chat about these superior Prosecco wines, it was interesting to learn that although there were different styles and sub-zones (Rive highlighting different villages, Cartizze being a famous sub-zone for quality, contrasting winemaking styles – all explained below with tasting notes) that all the wines shared an inviting generosity of ripe fruit and floral notes. 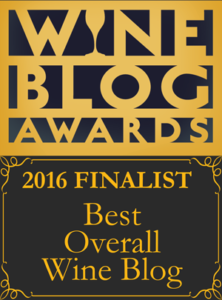 Even the top wines, which blew me away with their elegance, complexity and distinct sense of place, had a giving quality that I thought anyone could enjoy… and I respected that they didn’t sacrifice the generosity of their top wines, even if it was not completely appreciated by some “serious” wine drinkers. All of us have our different personal issues. 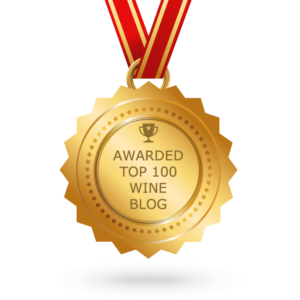 I understand that those who feel the need to put on a stern, judgmental tone when talking about wine are, many times, battling their own insecurities, and thus have a strong desire to prove their worth to others. 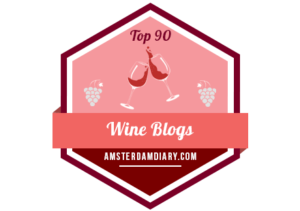 But I decided a long time ago that I did not want to go down that road, and I missed out on a lot of opportunities because it was more important for me to promote a more generous approach to talking about wine. 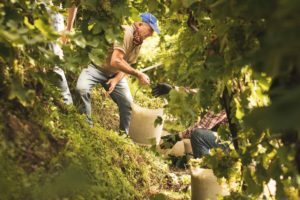 My attitude was that I didn’t want to be part of a workplace or group of people that did not make generosity one of the main priorities of their wine mission. 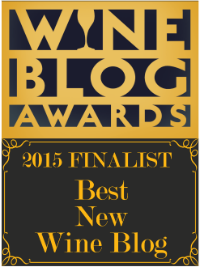 And just like people, generous wines are also judged, but I am hopeful that times are changing. 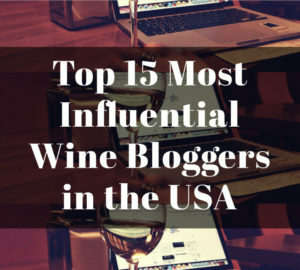 Now, as many voices have a chance to speak up through the power of social media, we will discover the hidden gems of wines that are stunningly gorgeous yet are generous enough to be shared with ALL our friends as well. 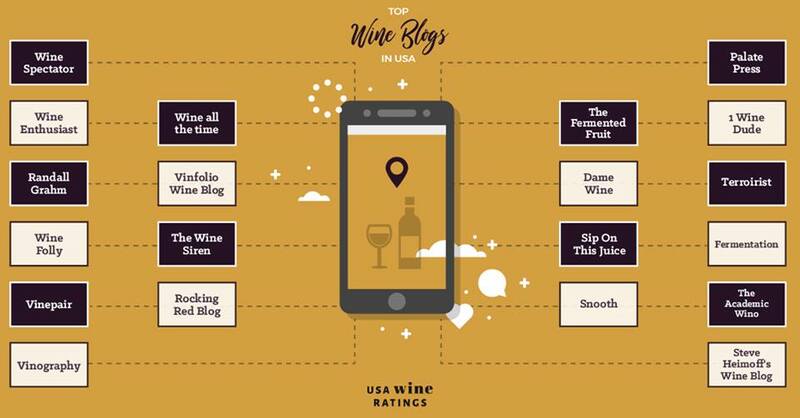 ***If you want to know more about Twitter “virtual tasting” programs such as the above go to the #Winestudio website. 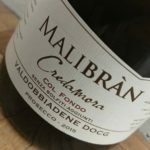 Conegliano Valdobbiadene Prosecco Superiore is a DOCG sparkling wine produced exclusively in the hills of the Conegliano Valdobbiadene zone; it is made from the Glera grape variety. The denomination is made up of 15 communes (municipal areas), and takes its name from the zone’s twin capitals: Conegliano, the cultural capital, which was responsible for the creation of the Prosecco phenomenon thanks to being the site of Italy’s first School of Winemaking, where this wine’s production method was perfected; and Valdobbiadene, the heart of production in the zone: it is surrounded by vineyards of extraordinary beauty, with a special vocation for producing high-quality grapes. 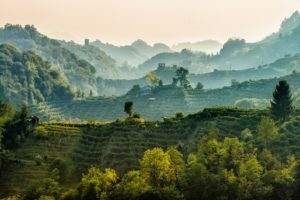 SIDE NOTE: Vineyards located in Conegliano Valdobbiadene can use either Conegliano Valdobbiadene, only Conegliano or only Valdobbiadene regardless if they are located in one capital or the other. 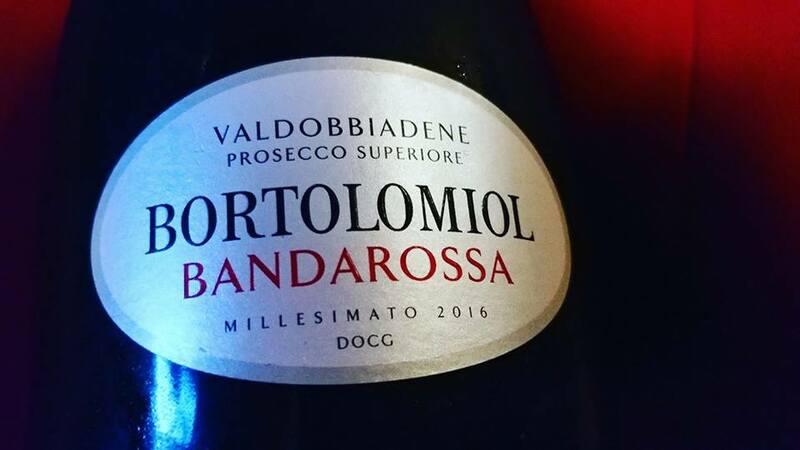 -2016 Bortolomiol, Extra Dry, ‘Banda Rossa’, Valdobbiadene Prosecco Superiore DOCG: Juicy peach fruit with hints of citrus sorbet and a creamy body – Lusciously Divine. –Conte Collalto, Brut, Valdobbiadene Prosecco Superiore DOCG: Linear with lots of vitality and lots of chalky minerality – a true lady that doesn’t give it up all in the beginning. The term “Rive” indicates, in the local way of speaking, the slopes of the steep hills that are characteristic of the zone. This category of wine highlights the diverse expressions of Conegliano Valdobbiadene. 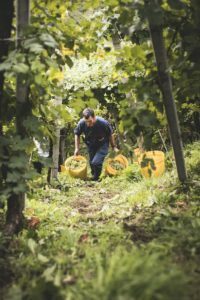 Rive wines are often obtained from the most high-quality vineyards, from grapes grown in a single commune or area, and so, it expresses the underlying characteristics that a particular terroir gives to a wine. Within the denomination, there are 43 Rive and each one expresses a different and distinctive combination of soil, exposure and microclimate. 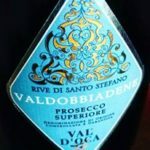 –Val d’Oca, Brut Nature, Rive di Santo Stefano, Valdobbiadene Prosecco Superiore DOCG: An elegant beauty with intense chalky minerality, lots of tension and energy – THRILLING! 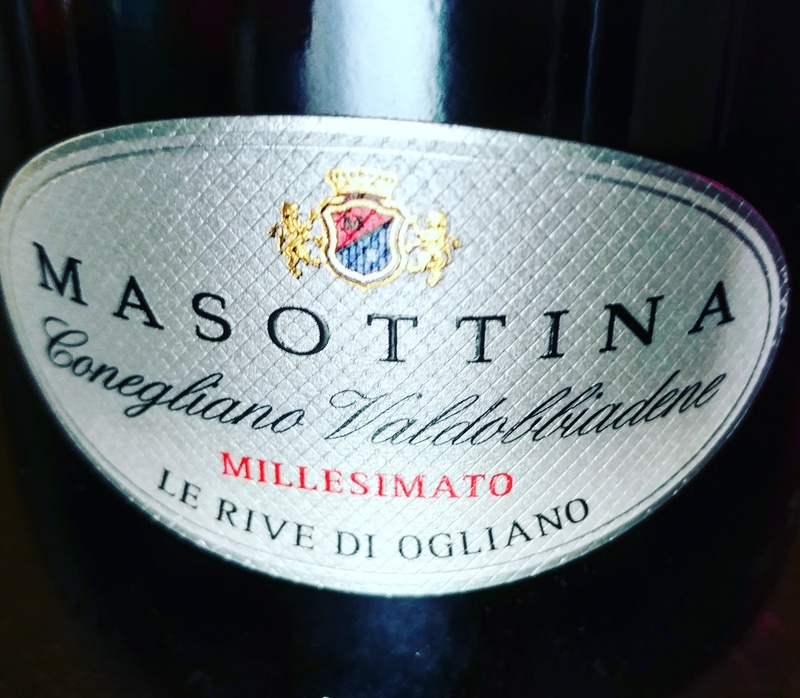 –Masottina, Extra Dry, Rive di Ogliano, Conegliano Valdobbiadene Prosecco Superiore DOCG: This luscious lady had a fine mineral edge with rich, tangy fruit flavors such as lemon confit and peach cobbler and a lovely edgy, long, oyster shell finish! 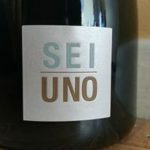 –Tenuta degli Ultimi, Brut, Rive di Collalto, “Biancariva”, Conegliano Valdobbiadene Prosecco Superiore DOCG: This 2013 showed that great Prosecco can age. YES, YOU HEARD ME RIGHT, 2013!!! 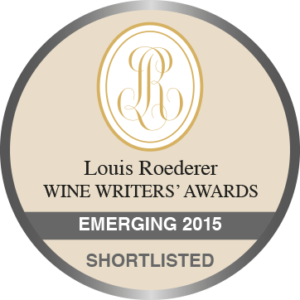 Pristine, exotic fruit such as lychee, with wild flowers and an elegant saline finish. 95% of Prosecco uses the autoclave for their secondary fermentation that makes the wine sparkling. The technique of the autoclave was invented by Martinotti (1895), was immediately adopted by the Conegliano Enology school (Italy’s oldest) and perfected for use with the local wines by the beginning of the 20th century (though it did not become widely used throughout the area until after WWII). Some may know the autoclave method by the name “tank method” or “charmat method” (secondary fermentation in stainless steel tank), but the autoclave is the preferred term for high quality wines such as Conegliano Valdobbiadene Prosecco Superiore DOCG, since it is used for the preservation of the beautiful aromatics and flavors that come from high quality Prosecco and should not be equated to bulk made “Prosecco-style” wine. Secondary Fermentation in bottle usually implies that a wine will have more “yeasty” “leesy” qualities such as toast and brioche-like notes and creaminess to the body. But sometimes the wine is left on the lees longer in the autoclave method, so those notes can be achieved in the previously mentioned technique as well. 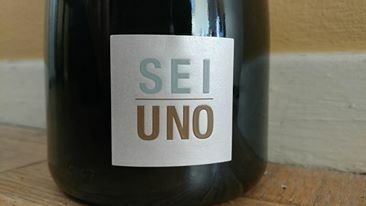 -2015 Bellenda, Brut, “Sei Uno”, Conegliano Valdobbiadene Prosecco Superiore DOCG, RE-FERMENTED IN BOTTLE: Richness with spiced toast and lemon custard yet good tension on the body. It evolves in the glass eventually giving notes of wet stones. 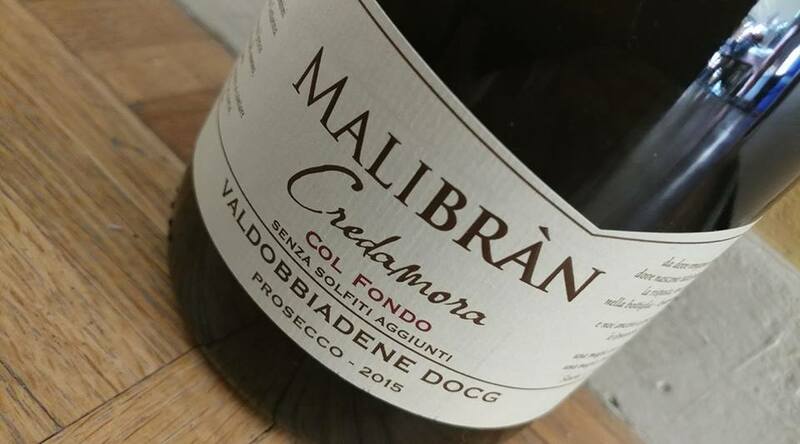 -2015 Malibràn, “Credamora” Rifermentato in Bottiglia, Valdobbiadene Prosecco DOCG RE-FERMENTED IN BOTTLE- NO DISGORGE: SUPER WINE NERDY & DELICIOUS – sugar covered almonds, violets, creamy body, hints of brioche with high notes of citrus blossom on the finish. 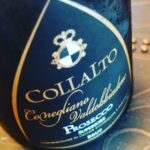 These types of Prosecco wines are called “Col Fondo” which means “with sediment”. 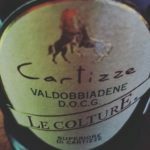 The Cartizze is a legendary sub-zone that is a highly fractured area, with 140 different owners of around 265 acres (107 hectares) that is said to have the ideal combination of mild microclimate, ancient soils and steep vineyards that produce deep concentration and complexity in their wines. Many times, their wines are considered “Extra Dry” and have more residual sugar than the “Brut” style due to the ripeness in the grapes, but the high acidity makes the wines seem dry on the palate. The first wine, drier version (Colesel), and the second wine, the sweeter one (Le Colture), both excel and the sweeter wine (with 23 g/l residual sugar) is seemingly dry yet richly delectable. 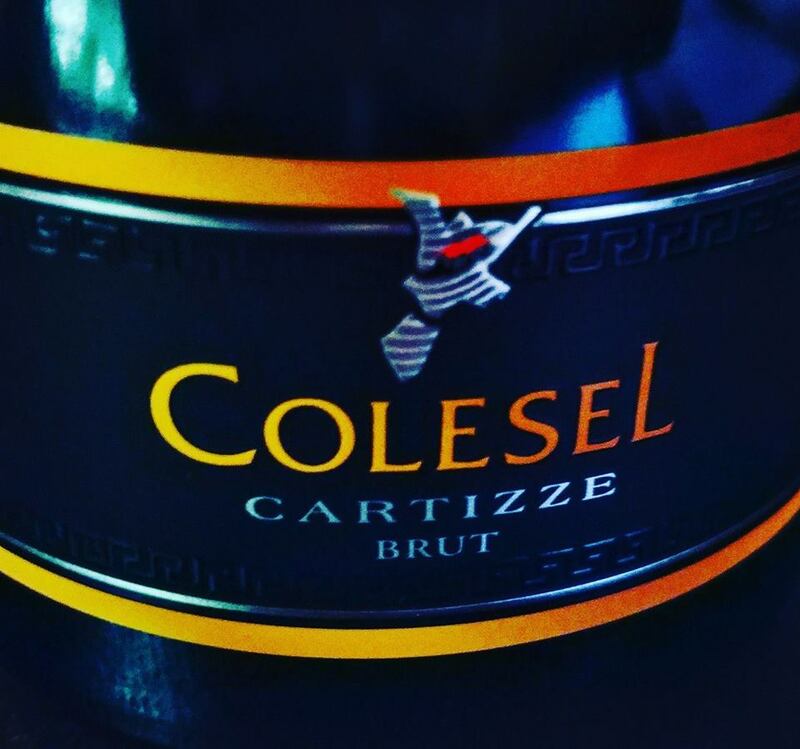 –Colesel, Brut, Valdobbiadene Superiore di Cartizze DOCG, Prosecco: Enchantingly ethereal quality with crumbly silty-stone and juicy stone fruit in the background – a wine with sense of place that offers engaging silky texture with fine bubbles. 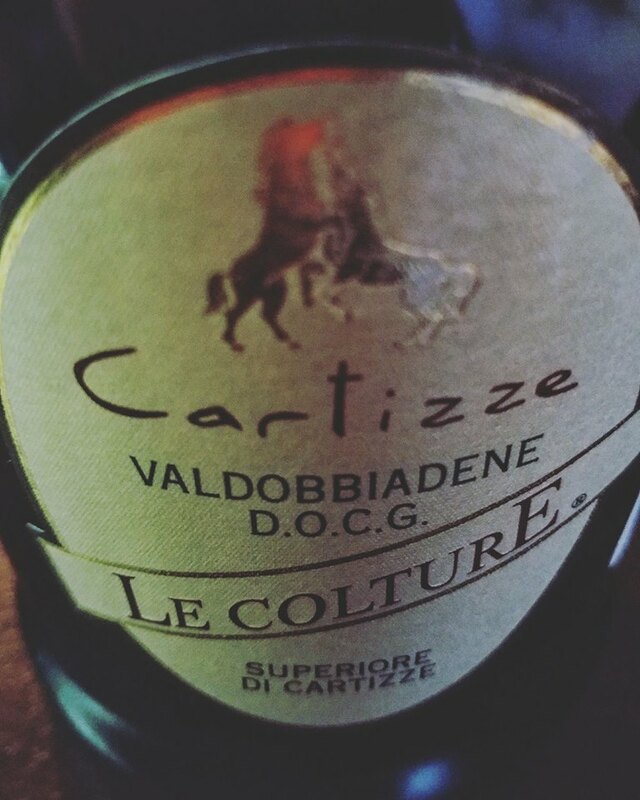 –Le Colture, Dry Valdobbiadene Superiore di Cartizze DOCG Prosecco: A deliriously delicious dream with intense perfume of orange blossom, white pebbles and a hint of lilacs, with lemon drops on the palate – intoxicatingly dangerous with a rich body. 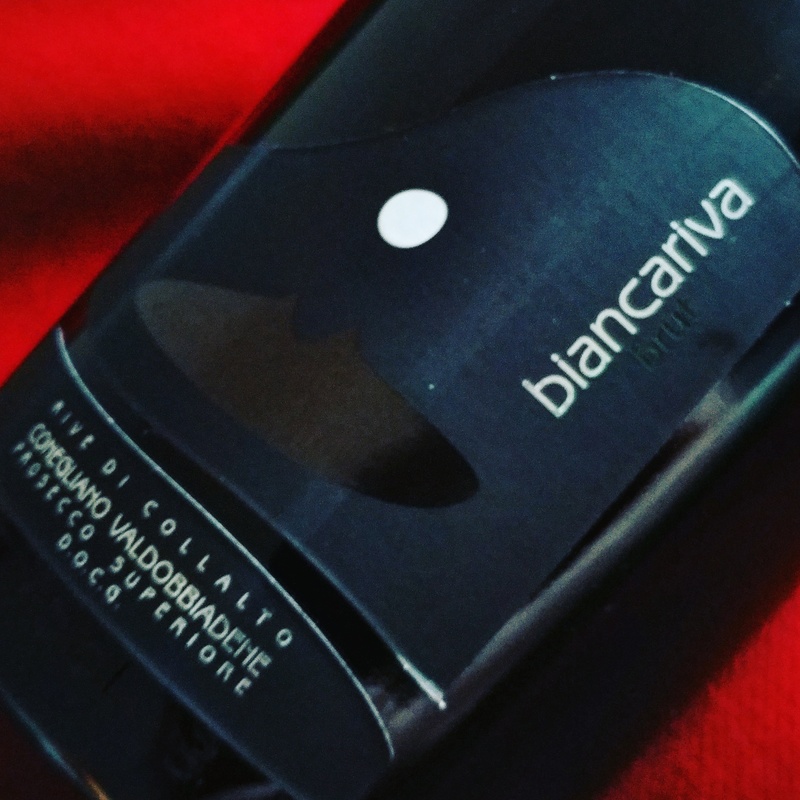 This entry was posted in Uncategorized and tagged #ConValDOCG, #winestudio, Cartizze, Col Fondo, Conegliano, Conegliano Valdobbiadene, Conegliano Valdobbiadene Superiore DOCG, Glera, Italy, Prosecco, Prosecco Conegliano Valdobbiadene, Prosecco Conegliano Valdobbiadene Superiore DOCG, Rive, Sparkling, Valdobbiadene, Veneto, Wine, Wine Tasting, Winetasting. Bookmark the permalink.